Welcome to the 1980s. Did you really want to come back? Many regard the '80s as an awful decade in music, perhaps the beginning of the end of good pop music. Others, feeling the need to rebuke this widespread criticism, look to bands such as Joy Division, Talking Heads, and the Cure as sources of light in the otherwise dismal decade (if you can make a legitimate case for "The Final Countdown", please, tell me). Empire of the Sun -- comprised of the Sleepy Jackson's Luke Steele and Pnau's Nick Littlemore -- seem to be in favor of popular '80s music, but don't take much influence from the bands listed above. Their debut album, Walking on a Dream, places itself right in the midst of the '80s revival radio stations so rampant these days. In terms of 1980s aesthetic, this album has everything necessary. Their name comes from an '80s novel later made into a film that launched Christian Bale's career. The music is a mix of swirling analog synth, funky guitar, and basic drum beats all placed in a world of reverb that sounds like an ethereal, distant realm of sound. Or perhaps just the ocean, given all of the oceanic metaphors throughout the album, like “Standing on the Shore”, “Half Mast”, and “Delta Bay”. Unfortunately, despite the well-developed '80s image, the music emulated is not anything worth reviving. The album is a worship of all those almost-new wave songs that topped the Billboard charts in that decade, and the ultimate question at the end is simply, why? Why not just go all the way and make a neo-classic new wave album? It is not for a lack of talent. “We Are the People”, the song that the album was almost named after, proves the duo's talent for making great music. It's just unfortunate that the song bleeds into “Delta Bay”, which features vocals that are brilliantly transplanted from the era, but again, the question arises: why would you want to do that? Given this, Walking on a Dream exemplifies another quality of pop albums that lives to this day -- they are not albums worth taking as a whole. They have their ups and their downs. Oddly, the songs that get more experimental -- namely, the lengthier songs “Country” and “Tiger by My Side” -- are much more interesting than the rest of the album, most of which is meant to be poppy singles that will dominate the airwaves. “Country” is purely instrumental and builds from jangly guitar backed with synths that recall J-pop more than '80s music, but as the song crescendos, the new wave influence comes in full effect. If new wave bands decided to invent post-rock (Talk Talk disregarded), it might sound something like this. Meanwhile, “Tiger by My Side” retains a certain pop aesthetic, but places it in the context of something much more indie rock -- essentially what MGMT perfected on Oracular Spectacular. Most everything else on the album simply passes by in a slow, tranced reverb. The music comes from miles away. I suppose I should be a little more relativist in my criticism. 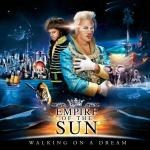 If Empire of the Sun want to make an '80s pop album, they have every right to do so. And if they really wanted to emulate the top songs of the '80s, then they did an excellent job in capturing that aesthetic. From the album cover to the over-the-top stylized vocals to the reverb-drenched sound to the fact that I have to hyphenate all of my descriptions to get this criticism across, this is an album that undeniably embodies the music of these two musicians' childhoods. I just can't understand why.